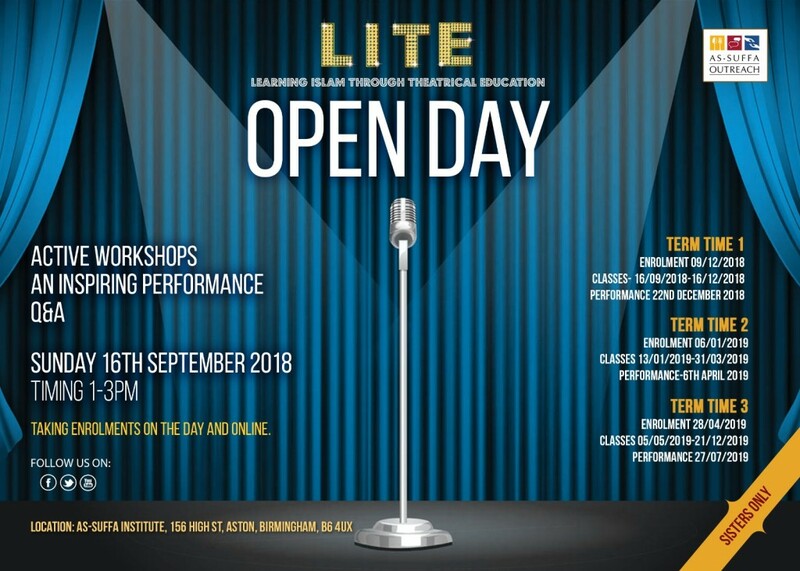 Learning Islam Through Theatrical Education (LITE) is a Project through which our primary aim is to provide a safe platform for today’s Muslimah to explore and develop the spiritual, moral and social self. Learning through the guidance of Quran and Sunnah they will explore the rich and diverse Islamic stories and teachings to enhance their knowledge, which they will implement into creative performances for sharing with other women in a safe environment – bringing to life the message of our Creator, our predecessors, our role models our Beloved Messenger and his companions. The project will improve creativity and imagination of the participants by bringing Islamic values and principles to life in today’s society in a fun and safe environment. The project seeks to work towards increasing the self-confidence of today’s Muslimah whilst bridging the generation gap between sisters, daughters and mothers within the Muslim community. It intends to dissolve prejudices between Muslims and Non-Muslims through raising awareness, improving education and knowledge on Islam through the medium of theatre. The project strives to foster a stronger relationship between people of Muslim faith, other faiths and of no faith.